When you don’t have the money to hire a publicist or a lobbyist and you still want to make yourself heard, you hit the streets—or set up tents and occupy a symbolic place of power. The sit-in has become a tent-in. 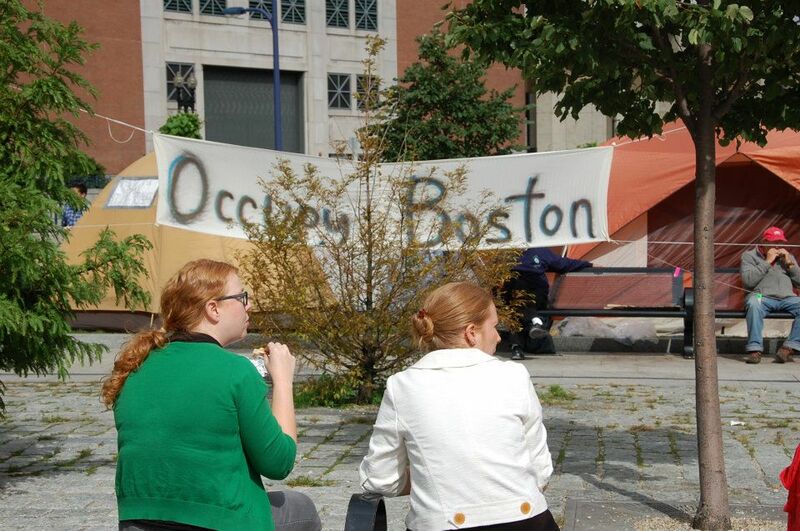 The Occupy Wall Street movement landed in Boston last Friday. Growing in momentum and spontaneity in cities across the country, the movement’s Boston branch has been well-organized and peaceful. Police hover along the periphery of the camp, but haven’t interfered with people holding signs along Atlantic Avenue, cars honking in support as they drive past. One of my clients is around the corner from the Federal Reserve building, so I walked over there on Monday and Tuesday to visit the camp and chat with the protesters. The people I met were male, young (20 & 30-somethings), under-employed or unemployed, veterans, students, ironworkers, and electricians. They are upset about the lack of work and opportunities for their generation, which they see as a symptom of the country’s growing social and financial inequalities, symbolized by Wall Street bailouts and the mysterious machinations of Federal Reserve. 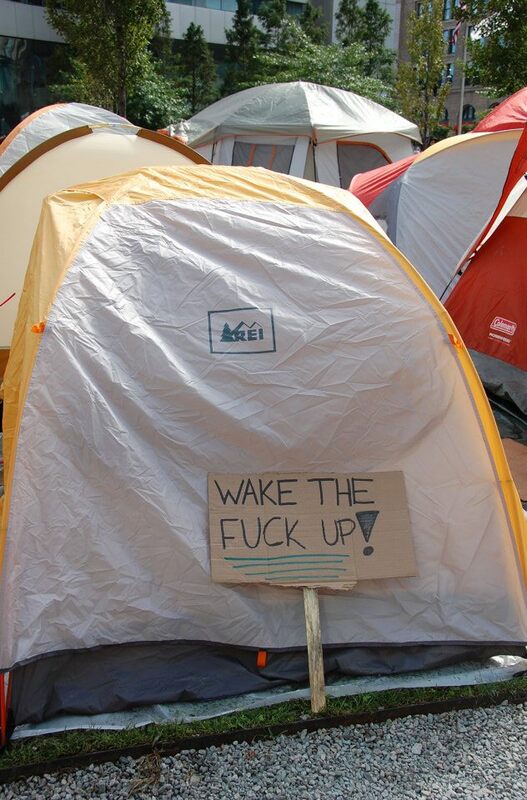 Thanks to lessons learned at Occupy Wall Street in New York, the tent city is carefully set up and clean. There is a mail table. Walkways made of wooden pallets and cardboard keep mud and dirt out of the tents. There are recycling and composting areas, and tarps cover clean and dirty laundry areas. There is a medical tent, a legal tent and a media tent, where you can go to speak to someone “official,” located near precious electrical outlets. The Greenway, the owner of the property, has donated electricity for the media tent’s monitors, laptops, and microphone. There is a covered area for bottled water and food donations. A table, staffed with greeters and stocked with pamphlets and other literature, sits near the entrance of the encampment. Nick DeTellis, 29, volunteers at the medic tent. A retired Army Sargent who served stateside, Nick believes that “Left, right, and center, we’re all upset about the same things,” he said. “We’re trying to spread a unifying message, but yes, people still don’t know what we stand for. That still needs to be articulated, and it’ll be worked out. I’m not claiming to speak for the movement, but Anonymous published a list of demands—I support that,” he said. There is an amorphous list of demands on the OccupyTogether site; you can check out photos, videos and more at OccupyWallStreet.org, and our own home-grown movement has set up the website OccupyBoston.com and Twitter feed @occupy_boston. An ironworker from Charlestown and an electrician from Boston were chatting on the edge of the camp when I walked by yesterday. What do you say to people who think you should spend more time looking for work and less time protesting, I asked them. The ironworker bowed his head and pointed to his baseball cap, which had “Ironworker Local 7” embroidered on the front. “I’m here because I can’t find a job. I’ve been looking for a long time now,” he told me. “Look at the city skyline—there’s no cranes. No cranes means no work. There’s nothing out there for me right now. When I found out this was happening I put my tools down and came here to be a part of it.” His two brothers are in the military and also plan to join him at the protest when they’re finished with their tours—and so do their friends, he added. The main goal of the Occupy movement, at least for now, seems to be to engage in a dialogue with all types of people (including office workers and bankers in the financial district) across the political spectrum, and to raise visibility and awareness, which is the first step toward changing the status quo. 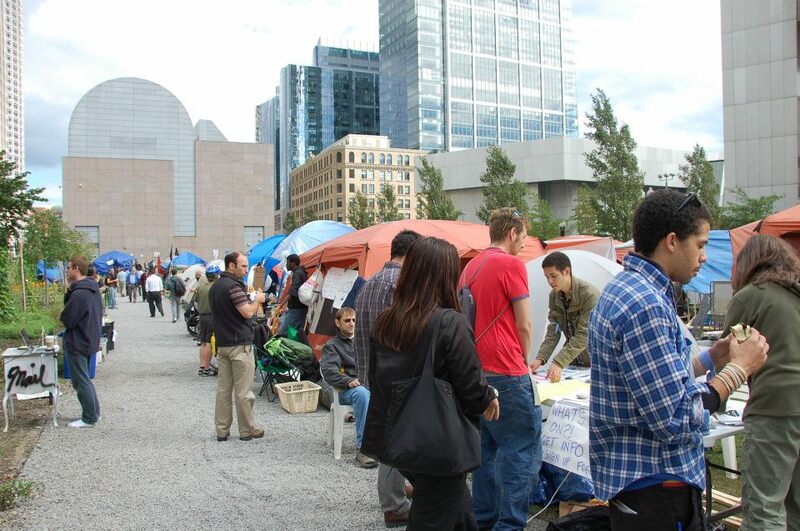 Occupy Boston plans on being in Dewey Square for at least a month, maybe more. Stay tuned, and if you’re in the area, stop over and check it out. Well written article. No question this is getting to be a have and have not nation and is this what anybody wants, including the rich? I don’t think so. Great article! We should all be out there demonstrating. I am inspired by your article and plan to be in Boston’s Tent City supporting this worthwhile movement. My father was an ironworker and loyal member of Local 7 and you can bet he would support this protest. Rock on! RIP to the late and very great Johnny Rauseo. I always think about him but have been particularly wishing he was still around as I would love to hear his take on current events, especially as someone who survived the Great Depression 1.0. Don’t forget your brothers were ironworkers, too. a big X and a O.
hey Ross – right on, man! Thanks for commenting and sharing your perspective. It’s really fascinating to me to hear all sides of the debate and discussion that those protesting have stirred up. It’s about damn time people (i.e. the anesthetized, shop-till-you-drop masses) wake up and smell what’s cooking out on the streets. I’m gonna subscribe to your blog now, but I have a feeling you’re waaay too brilliant for me (for real!) and thus I may not understand everything you say, but I’ll try, dammit. Take care, and keep writing. Thanks for reading and subscribing to my blog! Despite my general skepticism regarding most activism on the Left, I must say that the buzz these “occupations” have generated is impressive. An intuitively anti-capitalist sentiment might finally be reawakening among the social masses — now the primary concern must be to direct them toward a better understanding of the scope and complexity of the problem. For not just any form of anti-capitalism is desirable: many of the alternatives proposed to capitalism are reactionary in nature, and would prove far worse than capitalism. In terms of the content on my blog, I think you underestimate yourself. Some of my posts regarding my research probably require a degree of specialized knowledge, but I still try to write in a way that’s clear and accessible to all. I’m viewing all this from Australia and I’m horrified at what is happening to middle America – so much financial hardship and no clear solution in sight. hi Tina – great to hear from someone in beautiful Oz. Really want to go there someday. I’ve been reading quite a bit about how great the Aussie economy (and Canada, now that I think of it) is doing compared to the US, in spite of your many challenges (climate change…droughts, flooding, etc. comes to mind). Anyway, I’m horrified too, and especially worried for our kids who will wind up inheriting this mess. Our government is dysfunctional and without a clear policy in sight from either side (or willingness to compromise to get things done), those of us in the trenches are screwed. I’m not sue what else to say, except stay tuned! At least people are finally coming together to make themselves heard. Let’s hope those in power will listen before things get worse. This would be lovely, if it were true. As you can read for yourself in the Conservancy’s statement dated Oct. 6 (here: http://www.rosekennedygreenway.org/the-conservancy/news/?ccm_paging_p_b376=6), a permit is required for this type of free speech protest, but the Conservancy has chosen not to enforce that violation for this group. They state in their Oct. 11 document that they support this free speech, but in the Oct. 6 document, they aren’t exactly volunteering to “donate” the free use of electric outlets. Instead, they were essentially bullied into agreement by the threat of running fuel-buring generators as an alternative. I remain baffled why, if the greenway, Mayor & Governor are so supportive of this free speech, WHY doesn’t Occupy Boston have a PERMIT to conduct this protest. I also personally witnessed this group blocking the sidewalk on Atlantic Ave. for at least 15 minutes during rush hour earlier this week, while police merelly looked on from the other side of the street, without taking action. While minor, I fail to understand how this conduct is not considered to be “disruptive” and why the police wouldn’t ask the group to clear the sidewalk. hi Karen – thanks for reading, for commenting, and for adding the Greenway link. I asked about the group’s power source, and that’s what the person I spoke at the media tent told me (that it was being “donated”). 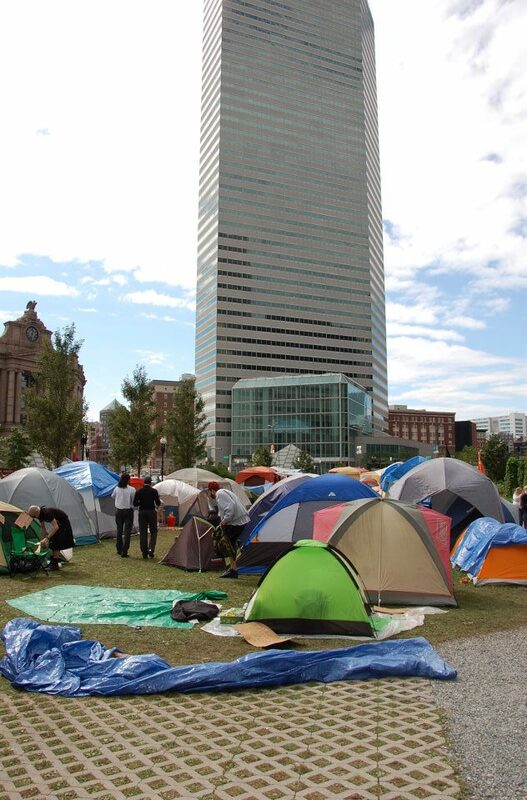 Beyond that though, I wonder: is Occupy Boston in the process of getting a permit? They had legal people (or at least a tent) there–which I’m sure has something to do with handling arrests as well. Did they pick Dewey Square because it was a public/private hybrid type of space like Zuccotti Park on Wall Street? I don’t know. Protesting is by nature disruptive. Yes it’s inconvenient to the rest of us — that’s the whole point, as far as the protesters are concerned. People need to be heard, from all sides of the political spectrum. If that means holding up traffic at rush hour to get their point across, then it looks like that’s what they’ll do. Thank God we live somewhere we can express ourselves — peacefully and respectfully, of course. My guess is it’s going to get bigger and louder, so be prepared. 1. I would imagine if they were going to apply for and be granted a permit, it would be done by now, so my guess is that they continue to operate without the true “permission” of the Greenway Conservancy. 2. The Oct. 6 document makes it clear that Dewey Sq. is indeed open to the public, but only bet. 7 am – 11 pm. Overnight, they’re legally trespassing. That document also makes it clear that they are required to have a permit to set up tents, etc., which as of that date had not been done. 3. I agree that the nature of a protest is to disrupt the status quo and attract attention, but I think it crosses a line to disrupt pedestrian access to public sidewalks, especially so close to such a heavily travelled station. In a nutshell, I would whole-heartedly support this group’s right to protest/free speech, IF they had the required permit, and left the sidewalks clear. I find it regrettable that they haven’t done these things.